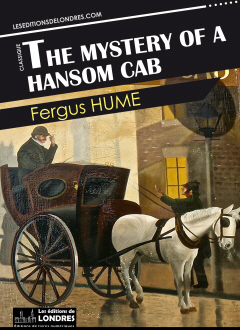 “The mystery of a Hansom cab” is an 1886 crime novel by New Zealander writer Fergus Hume. “The mystery of a Hansom cab” is often considered as the most famous crime classics of the Victorian era. The action is set in Melbourne in 188X, a Thursday night. We discover two drunk men: One helps the other into a cab, seems to recognise him and moves away but apparently comes back, then gets into the cab and after a while leaves again. When the cab driver stops, the man at the back is dead. The murdered man is Oliver Whyte, a young man with no money who has arrived from England. He has a friend, Moreland. Whyte had a row that same night with Mark Frettlby, a wealthy Australian. Apparently, he was promised to his daughter, Madge Frettlby, and chosen over Brian Fitzgerald, a young man of Irish descent. That night however, Frettlby informs Whyte that the marriage is off. Whyte was furious. The policeman in charge of the case, Gorby, is convinced that Fitzgerald is the killer. It quickly becomes apparent that the evidence is against him, and so Fitzgerald is arrested. Calton, a great lawyer, will defend him. In order to fight the evidence assembled by Gorby, Calton seeks the help of another policeman, Kilsip, who is also a rival of Gorby. Kilsip will find numerous new elements to the case, including the existence of a lady of little virtue, Sol Rawlins, who had apparently brought Fitzgerald some key documents the same night. Then the trial of Fitzgerald takes place; the scenes are very credible by the way: witness question, counter interrogation etc. and Brian is freed. He seems to know the truth but won't reveal what he knows, seemingly in order to protect Madge. Why? In spite of his victory, Calton won't give up on the case; he still wants to understand what happened. Finally, they discover a Rosanna Moore, discovered to be Mrs Bunnerstripe's daughter and Sol Rawlins' mother. They learn that many years ago, Mark Frettlby was in love with actress Rosanna Moore, that they fled together to England and that Sol Rawlins is their child. New turn of events: Mark Frettlby dies. His will is read; he admits everything to the child, confirming the secret, but to everyone's surprise, he claims not to have killed Whyte. Conclusion: by the end we discover the killer's identity. It is Whyte's friend, Roger Moreland. He wanted the papers proving Rosanna Moore had been Frettlby's wife, in order to blackmail Mark Frettlby. But Moreland did not mean to kill Whyte, it was an accident, he says. Moreland is arrested, and kills himself in jail. The secret of Frettlby's relationship with Rosanna, and the secret of Madge's relationship with Sol Rawlins are kept. Brian and Madge leave Australia and sail for Europe. Even if the investigation of the crime scenes are probably beneath those of Conan Doyle's Holmes and Gaboriau's Lecoq, they are well-written and credible. Apparently, Hume spent a significant amount of time gathering details, evidence and general observations in Little Bourke Street, a Melbourne street notorious at the time for its criminals and prostitutes. And of course, what is often not mentioned is the realism, detail and quality of the Court scenes, obviously due to Hume's experience as a Barrister's clerk and his study of the law. To the best of our knowledge, this is the first time a crime novel describes court proceedings with such precision and detail. Hume has never hidden his influences. He started by writing plays but could not get them produced in Melbourne. Meanwhile he observed the success enjoyed in Australia by the translations of Gaboriau's works. He spoke to the owner of his local bookshop and bought all his works, all eleven of them, he goes on mentioning, and decided to write a novel of the same genre. In this book there would be a mystery, a murder and a description of Melbourne's slums. Translations of Gaboriau and Boisgobey's works were then widely available in the English-speaking world. Between 1881 and 1886, the British publisher Henry Vizetelly had published “Gaboriau's sensational novels” and “Boisgobey's sensational novels”. Hume will find the title and the idea behind it in Le crime de l'Omnibus. As for the crime scene investigation, deduction, search for material details, legal proceedings, but also the idea of a secret buried in time, the description of a class-based society, and social relations marked by class barriers, all of this he finds in the work of both French writers and adapts it in his own brilliant way. Focusing too heavily on Hume as a great imitator of other successful writers would be totally unfair. He was no more an imitator of Gaboriau than Boisgobey himself, and Gaboriau has never denied the inspiration he received from Edgar Allan Poe. There are numerous elements which make “The mystery of a Hansom cab” a very original novel indeed. First, the novel is much better balanced than many of the Gaboriau and Boisgobey novels. Gaboriau sometimes suffers from the division in his books between the side of the crime novel itself and the adventure-driven, historical one that explains the former. Boisgobey intermingles the two aspects, melodrama and crime a little better, but the never ending twists to the plot become slightly tiring. Certainly, Hume's novel, despite being a little complicated, has numerous layers to it: crime investigation, description of Melbourne's society, functioning of the Courts, a love story etc. But one of the key originalities is the idea of a double investigation: Gorby starts, and then Kilsip follows on. And the fact that the two are so different and are fierce rivals makes it even more interesting.